tailbone surgery, joint problems or any other back problems you may have? Do you find it difficult to remain seated for long periods of time? "Rare blend of not too firm and not too collapsible". meaning this cushion is the solution for sitting in complete comfort. 2. REMAIN SEATED FOR A LONG TIME- Why should you have to suffer while working? Doesn't sitting uncomfortably ruin your focus? 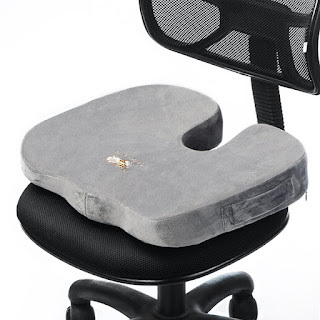 With the CushionCare seat cushion you can enjoy long periods of sitting every day and reduce your pain immensely. 3. REDUCE BACK PAIN significantly by providing tailbone relief for your back. The main purpose of the seat cushion is to reduce the tension in your back when sitting on chairs, car seats, planes, wheelchairs and more. Why Choose The CushionCare Seat Cushion? We have begun to use this in the office chair at the computer. It is super comfortable and I love the way it feels. It comes with an extra pillow case so that you can change them out when you need to wash one. The cushion has handles on the side that makes it easy to carry on the go. Working in an office this is great to have since I have to sit for 8 hours a day. I know its not meant to be but I also used this for extra lumbar support sometimes and it worked great for that too. If you have to sit a lot you need a Cushion like this!